At last we have received our final confirmation that we are going to Guyana. The last of the red tape has been completed and we should be off on 13th February 2007. The rest is up to us. We have now had all of our injections, including rabies, yellow fever etc etc and we just have to sort out the Malaria regime. The dentist is underway and all medical checks have been done. Yes, we have to have a full MOT. Some of the joints are a bit rusty but most of the infrastructure seems OK. The next milestone is Lucy and Matt's return from their big adventure. We are expecting them on 9th December. How exciting! We received a picture of them on the Great Wall of China. We are just a little bit jealous!!!! They are back in Thailand now, chilling out before the long trip home. Mary is working up to 26th January and I will try to sort out the things that need doing on the home front. If you look at the map, we will be in Linden in the North East of the country. 10,000 views so far - new counter starting again! All the latest articles are on the left hand side but there are hundreds more. Just scroll down this right hand sidebar and firstly you will find the latest news updates and then below them are all the blog entries in date order from before we left in 2007 as well as blogs and favourite sites from other volunteers. Happy reading! Welcome to "Stephen and Mary @ Guyana"
We travelled to Georgetown, Guyana in February 2007 and were there until February 2009 - two years in all. Hope you enjoy reading about our adventures! We were Volunteers for VSO International from England. All views expressed in this blog our our own and do not represent the position of VSO. Enjoy reading and contact us if you wish! To read about the lastest news, just scroll down this sidebar. In the four years since I started writing this blog about our adventures with VSO in Guyana, the site has received over 10,000 hits. It's now time to stop the counting as we have returned. Why not check out my work website? It's 7th September 2010 and we've been offered a one year placement in Rwanda starting in January 2011. It's not finalised yet so we're hoping for the best. It's a French speaking country which has just changed its language of instruction to English. It's 29th July 2010 and we have just been told that we have been assessed and accepted for out next VSO placements. It's 2nd June 2010 and we've applied for VSO again, hopefully for February or September 2011. It's 8th May 2009 and we go to Harborne Hall, Birmingham for three days for the Return Volunteers Weekend. It's 13th March 2009 and we drink a toast to those in Guyana as we did on 13th of every month, the date we arrived. It's 7th March 2009 and Ann throws us a party with family and friends to welcome us home. It's 3rd March 2009, it's my birthday and we go to El Nido's to celebrate our return. It's 2nd March 2009 and we arrive home early in the morning to be greeted by Dan, Matt and Ann. It's 1st March 2009 and we fly from Las Vegas to Los Angeles and the overnight by New Zealand Airways to London Gatwick. It's 22nd February 2009 and we have been in New York for nine days and will go to Las Vegas tomorrow. Just look at the main posts for a report. It's 12th February 2009 and we spend our last night in Guyana with the "13th Club" (the day we arrived and meet every month) at Nicolette and Martin's house. It's 9th February 2009 and we go to the Brazilian restaurant for one last meat feast with Mira and michaela and her Mum who is visiting. It's 2nd February 2009 and we will be home 4 weeks today. It's 30th January 2009 and Mary starts to feel normal again too. It's 16th January 2009 and Mary and I are struck down with a debilitating virus which is to last over a week. It's 3rd January 2009 and we return to Guyana for the last five weeks of work before completing our placement. Thanks to everyone who keeps in touch and don't forget to leave a comment when you visit the site. It would be good to have a two way process and let me know who you are by making a comment. It's easy. Just click below the article and you can comment and I'll know where you are from. 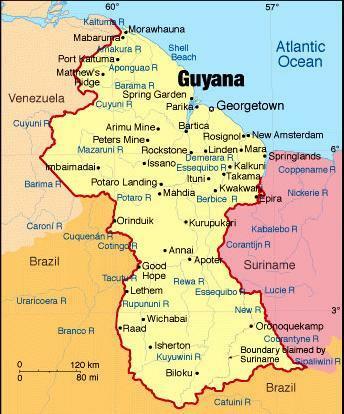 Do you want to know more about Guyana? Most secondary school classrooms are like this - large hall with 8 or so classes divided by blackboards.